Following the lottery yesterday in which participants in the 30 April parliamentary elections were given ticket numbers, the Iraqi election commission has released an official list that also provides the first official overview of coalition and entities that will take part in the election. It is noteworthy that although the deadline for forming coalitions expired late last year, IHEC has so far refrained from publishing a list of the constituent elements of the various coalitions. One reason may be that the process of certification of entities continued well into 2014, with constant updates to the official list of individual entities. This means that there is still no official source that can be used for evaluating the potential strength of the various coalitions, but the most recent list is at least helpful in that it authoritatively distinguishes between coalitions and entities that will run on their own, ending some of the speculation as regards the choices of some of the smaller parties. The key statistics of the new list are as follows. Altogether 107 lists will take part in the 30 April parliamentary elections. Of these, 36 will be coalitions. A maximum of 71 entities will run on their own. All the main coalitions are well known. With respect to Shiite Islamists, the following main groups are defined as coalitions: State of Law, Muwatin (mainly ISCI), Ahrar (Sadrists), Islah (Jaafari) and Fadila (with some lesser known smaller parties). Smaller “coalitions” include list 238 which is organized by Sabah al-Saadi, an ex-Fadila MP known for his ferocious verbal attacks on Prime Minister Nuri al-Maliki. There are also what seem to be pan-Shiite lists in some of the northern governorates, with some uncertainty as to exactly who among the main Shiite parties are enrolled in them. This certainly applies to Nineveh (list 227) but also list 222 and/or 249 (Salahadddin). Towards the secular end of the Shiite spectrum, there is a coalition list (228) headed by Wail Abd al-Latif, a well known Basra federalist. Regarding the controversial question of the participation of the Sadrist breakaway (now pro-Maliki) group known as the League of the Righteous, some rumours suggest they will not run as a single list but rather enter as candidates on separate pro-Maliki lists. Analysis of this must await publication of the candidate lists. As for the Sunni and secular forces that formed Iraqiyya in the last elections, they are now split in at least three main coalitions: Mutahiddun (Nujayfi), Wataniya (Allawi) and Arabiyya (Mutlak). Noteworthy is the all-Iraqiyya list in Diyala (246), which in this context smells something like a Sunni sectarian equivalent of pan-Shiite lists seen in Shiite-minority areas in the local elections last year. There is also a Sunni-secular list in Kirkuk (242), calling itself the Coalition of Kirkuk Arabs. Press reports claim Nujayfi will run only in six governorates (as list 259 in Nineveh, Salahaddin, Baghdad and Anbar; on pan-Sunni lists in Diyala and Kirkuk). If true, this means Nujayfi’s party has given up some of the pan-Iraqi spirit seen in the last local elections, when it also ran lists in some places in the south, notably in Basra. The implication is inevitably a more Sunni, sectarian outlook. Rump Iraqiyya in the shape of Ayyad Allawi’s Wataniyya list may be on the defensive if the last local elections are anything to go by, and the only other remaining major pan-Iraqi, secular coalition in the running is the alliance of communists and other minor secular groups (232). The main Kurdish coalition list is apparently number 210. There is also a special Kurdish list in Baghdad (203). Confusion remains regarding the exact structure of the Kurdish electoral effort because unlike the other parties, the Kurds continue to list their individual parties as electoral lists alongside their coalition. As for the parties that run individually, they are mainly the smaller ones. Among them the Sunni islamist Islamic Iraqi Party stands out (263). The list is also helpful in ending some of the speculation regarding various Shiite Islamist parties whose coalition allegiances were in doubt. The party of Shirwan al-Waeli, formerly with State of Law, is still listed separately (284), as are those of Haytham al-Jibburi (230) and Saad al-Mutallabi (240). Conversely, there are no signs of parties registered in the names of people like Ali Fayyad, Ali al-Dabbagh, Adnan al-Shahmani, Amir al-Fayiz (Basra Shaykhis) and Abd al-Karim al-Muhammadawi (aka Lord of the Marshes), meaning they have likely opted out or have joined a coalition. A fuller picture will emerge when candidate lists are ready in February/March. Before that, the potentially controversial process of candidate verification – including de-Baathification measures – will take place. The Iraqi electoral commission (IHEC) today held a lottery for electoral ticket numbers for the upcoming 30 April parliamentary elections. Although a rough picture of the coalition-forming process has been in the public domain for some time, the information released today provides the first official confirmation of the electoral alliances that have been approved for participation in the election, following certification of individual entities towards the end of last year. It should be noted that at the time of writing, the complete and official list of approved coalitions itself had not been published by IHEC, and that the following discussion is based on reports about the election list numbers as reported by the Iraqi press. However, the picture that emerges is consistent enough. Generally speaking, it is a story of fragmentation in all political camps. For example, the idea of a pan-Shiite list has hardly been on the agenda this year. Instead, all the major players run separately: Maliki’s State of Law (list 277), Hakim’s Muwatin (273), Sadr’s Ahrar (214), Fadila (219) and Jaafari’s Islah (205). A possible caveat concerns the Shiite-minority governorates (Salahaddin, Nineveh, Diyala). Lists sounding like variations of the Watani alliance of Shiites in parliament appear in all these places, and it could be pan-Shiite lists on the pattern seen in last year’s local elections. Confirmation of this must await release of the comprehensive IHEC coalition list, and possibly even the candidate lists themselves, expected in February/March. Similarly, what was once the secular and increasingly Sunni-backed Iraqiyya has now fragmented into a number of factions. Parliament speaker Nujayfi’s Mutahhidun got list number 259; Allawi’s list now just called Wataniyya or “nationalism” got number 239; the Arab Iraqiyya bloc of deputy PM Mutlak got number 255. With regard to the Kurds, the situation is slightly confused because both political entity numbers and coalition numbers have been published. Of these, there is little doubt that Goran and the Islamists will run separately, but the rationale for publishing the entity numbers for KDP and PUK alongside various coalition numbers is not clear. Again, it is possibly better to await publication of the candidate lists to see what sort of alliances the Kurds are running within the KRG and in Kurdish-populated areas outside the KRG respectively. For the time being, the information available is too sketchy to make very firm conclusions about the overall direction of the upcoming elections. For example, candidate lists are needed to determine whether all Shiite parties are joining a common sectarian ticket in places like Salahaddin and Nineveh, or whether just a few take part. Instead, ongoing developments in the Iraqi parliamentary debate may perhaps provide some clues. Firstly, the recent announcements of new provinces in Nineveh and Salahaddin catering at least to some extent to Shiite Turkmen audiences could be a suggestion about a move towards a more sectarian electoral climate. On the other hand, attempts to create a parliamentary oversight committee to supervise the election commission itself have been spearheaded by Sadrists and Kurds, with Muwatin and State of Law resisting (and successfully defeating the motion). Whether the Hakim-Maliki relationship is still salvageable remains to be seen, but given the amount of fragmentation seen today it seems fairly clear that these elections are unlikely to produce a clear single winner. We are thus left with a situation in which post-election coalition building and maneuvering may prove as important for the final outcome as the elections themselves. More on the New Iraqi Provinces: Election Stunt or a Strategic Vision of Local Government? The surprise decision by the Iraqi government last week to announce plans for altogether four new provinces has been met with mostly predictable reactions among Iraqi politicians. Kurds are angry; as are Sunni Arabs and particularly those of Nineveh who will get most directly affected by the central government’s plans to parcel out some of their territory to create new governorates. Conversely, there has been jubilation in some of the minority communities affected by the plans (Turkmens, Shabak, Christians). Few know what the people of Falluja – the last area to become a projected province – may think about the plans. Their problems are of a more immediate nature, with dramatic estimates of the number of refugees having left the city because of the recent flare-up in the conflict between the Iraqi government and sympathizers of the Islamic State of Iraq and the Levant. At first it was tempting to assume that the reason behind the sudden declaration of new provinces related to the upcoming 30 April parliamentary elections, with Prime Minister Nuri al-Maliki possibly trying to win votes among Shiite minorities (and Christians) outside the Shiite majority areas. However, interestingly, a more elaborate justification for the scheme has now been presented, suggesting there could be an attempt at grander strategic thinking behind the initiative after all. Tareq Harb, a close legal adviser to Maliki, has maintained that the move is aimed at pre-empting the creation of more federal regions and the potential split-up of Iraq. According to Harb, by weakening large governorates like Basra and Nineveh, the prospect of them turning into federal regions lessens since the tiny rump governorate in each case would be “a joke” of a federal region. Among the potential new governorates enumerated by Harb are Rawa (Anbar), Balad and Dujayl (Salahaddin, both with Shiite populations) and Qurna (Basra). Meanwhile, the legal framework concerning the creation of such new governorates remains unclear. It has not helped matters that the minister of state for the governorates, Torhan Mufti (himself a Turkmen) has declared that the provincial powers law of 2008 does give the central government a right to change provincial boundaries. The same claim has been reiterated by a member of the parliament committee for the governorates, but neither claim has been buttressed with a reference to a specific article of the provincial powers law. It would be helpful if they (or anyone else who knows) could do so. A cursory reading of the amended law of 2008 indicates a right of governorates to change their internal boundaries (sub-provinces) in article 7-11, but where is the alleged corresponding right of parliament to change provincial boundaries? 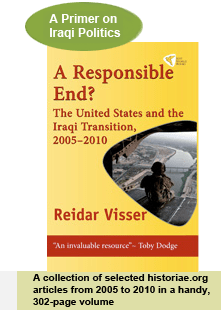 One would have thought the US government, which was influential in Iraq at the time the provinces law was adopted in 2008, had analysed this problem. However, whereas an annotated version of the provincial powers law by USAID sounds promising, it fails to produce the required clarity. It seems to agree that there is no power for anyone to change provincial boundaries in the provinces law itself; however it does refer to the 1969 law on provincial administration as an alleged basis for parliament to change borders. There are several problems here. Footnote 32 of the American reports refers to “a power of parliament to change provincial boundaries” in law 159 of 1969. However, article 4 of the 1969 law does not mention parliament at all: Instead, it refers to the revolutionary command council. Even more importantly, as the American report itself goes on to mention, the 2008 law abrogated the 1969 law and hence took away any specific framework that may have existed in that piece of legislation for the central government to create new administrative entities. Few believe these latest decisions will create changes on the ground in the near future. However, there is a qualitative shift in the Iraqi debate when the redrawing of provincial boundaries becomes part of the political horse trading process. Heretofore, provincial grievances have mostly been contained in the budgetary process, with a certain inflation of petrodollars and other dollars (including compensation for border provinces and provinces with pilgrimage traffic). But whereas money can be easily negotiated, the mere discussion of borders threatens to create precedents and goals that can be difficult to contain once they have been ignited. For example, the schemes for provinces in the Nineveh plains and Turkmen areas dovetail with far more ambitious schemes among Christian and Turkmen politicians to create federal regions in their own right. Another problem relates to scale. If areas the size of Falluja can have their own governorate, one would expect a degree of symmetry in the shape of a multiplication of other similarly small-scaled new governorates. Whereas the existence of micro-minorities like Turkmen, Christians and Shabak may conceivably be used as an argument for administrative separateness (advocates of their scheme refer to article 125 of the Iraqi constitution), no such argument is present in the case of Falluja. All in all, then, given the momentous implications of such vision, it seems doubly important that Iraqi politicians should be a lot clearer about the legal basis for the dramatic changes they now propose. The Iraqi cabinet made big headlines today with a shock decision to form three brand new provinces. Supposedly, there will be new governorates in Tuz Khormato (a Turkmen-dominated area currently in Salahaddin province), the Nineveh plains (a Christian-dominated part of Nineveh province) and Falluja (centre of the current Sunni-led uprising in Anbar province). With a recent decision to create Halabja as a separate governorate in Kurdistan, some observers declared that Iraq all of a sudden has 22 provinces, after decades of relative administrative stability in 18 governorates since the early 1970s. It is not like the inhabitants of Falluja, Tuz and the Nineveh plains will feel any major changes related to administrative status when they wake up tomorrow. Some of the uncertainty regarding the new move of the Iraqi government can be glimpsed from the language of the cabinet decision itself: The agreement on the formation of these new decisions was made “in principle”, to be completed after the necessary formalities “had been completed”. Those formalities were not detailed: A special committee including members of the ministries of justice and municipalities will look into the “standards and procedures” necessary to complete the transformation. This ambiguous choice of language in turn reflects wider legal uncertainties regarding any decision to form new provinces. In theory, despite the absence of any constitutional reference to administrative boundary changes, after 2003 such administrative changes were governed by a Baathist-era law, law no. 159 from 1969, which vested the power to change administrative boundaries in cabinet. However, the anachronistic nature of that procedure is attested to by a requirement that “the revolutionary council” approved the measure – an institution that Iraq now thankfully lacks. In any case, in 2008 a new provincial powers law specifically replaced the old provinces law (and repealed it), but it failed to make provision for new administrative boundary changes, meaning there is currently no detailed Iraqi legislation dealing with the subject of the creation of new provinces. That’s the ironic reality of the new Iraq: Whereas elaborate measures exist for the creation of new federal regions, no special provisions for the creation of new governorates exist. Of course, the absence of a law does not necessarily mean decisions on these matters are off limits to the current Iraqi government. However, in a democracy there will be an expectation that such momentous decisions regarding the administrative structure of a country are governed by laws. Indeed, the recent Iraqi cabinet decision to transform Halabja in Kurdistan to a governorate was accompanied by comments to the effect that a law was expected to be sent to parliament for approval, the lack of relevant formal mechanisms notwithstanding. But whereas the submission to cabinet of a separate Halabja governorate project reflected longstanding internal Kurdish debate on the issue (and eventually a modicum of consensus), no such consensus is known to prevail regarding these three latest would-be provinces. In sum, such is the uncertainty connected to today’s decision that it is tempting to view it as mainly empty rhetoric calculated to create happiness in particular political circles prior to Iraq’s 30 April parliamentary elections. The question then is what those interested political circles would be. In the case of Tuz and the Nineveh plains (Tall Kayf) one obvious answer would be minority groups in those areas that have long advocated autonomy – Turkmens and Christians respectively. Some view these projects as antidotes to Kurdish expansionism and potential annexation (either through article 140 on disputed territories or the Talabani project to change administrative boundaries back to pre-Baath conditions). It has therefore been suggested that the cabinet move today was an anti-Kurdish project, with Falluja thrown in as a new governorate simply in a rather strained attempt at mollifying Sunni Arab opinion. It would certainly look rather asymmetrical with a small Falluja governorate carved out from the vast Anbar – a hark back to the special administrative provinces seen in particularly ungovernable parts of the Ottoman Empire! Since the early 1970s, Iraq has experienced relative stability in its administrative map with minor changes to the administrative boundaries of the 18 provinces. If actually granted governorate status, these new entities could soon apply for status as federal regions – something which the proponents of the Nineveh plains unit have long hinted at. It would open the path for similar demands from oil-rich districts in the south who have long felt marginalized within the governorates of which they currently form, including Zubayr and Qurna in Basra. If Falluja can be a governorate, why shouldn’t they claim the same status, with similar population numbers and vast energy resources? Of course, the Maliki government is not known to be in favour of this kind of large-scale territorial fragmentation. Nonetheless, we now have yet another fictional act of state affecting centre-periphery relations in the new Iraq: The three projected new governorates come on top of a theoretical right for forming federal regions that is always rejected in practice, and a revised and very permissive law on provincial powers that few think can work in practice. For the time being, the Maliki government may feel safe that it can play with words in centre–periphery relations without having to face the consequences. In the long run, however, the increasing gap between rhetoric and practice – and between public expectations and the state’s capacity to deliver – may form a contributing factor to a more radical political climate in Iraq. *Postscript: The changes above are contained in conclusion number 2 from the Iraqi cabinet meeting on 21 January. However, hidden away further down in conclusion number 4 is also mention of a law project to transform the largely Turkmen Tall Afar area of Nineveh to a governorate, and to send this law to parliament for approval. That does seem to indicate plans for altogether four new provinces. Tall Afar has apparently reached a more mature stage of progress towards governorate status. It is also clear that the Iraqi government believes it can send laws for changes of borders of individual governorates to parliament, quite without there being a more elaborate legal framework for such administrative changes in place. The cabinet can also probably rest assured that parliament is unlikely to approve these measures.